Town in the territory of Issachar, allotted to Manasseh (Josh. xvii. 11). It is identified with the modern Endur, on the northern decline of little Mt. Hermon (Nabi Daḥi), a hamlet now abandoned, but which had in Roman days a large population. Cheyne, following Graetz, reads "'En Ḥarod" (see Judges vii. 1; Budde, "Richter und Samuel," p. 112). According to the Hebrew text, the author of Ps. lxxxiii. considers Endor to have formed part of the plain of Kishon and, as such, of the battle-field of Megiddo. In I Sam. xxix. 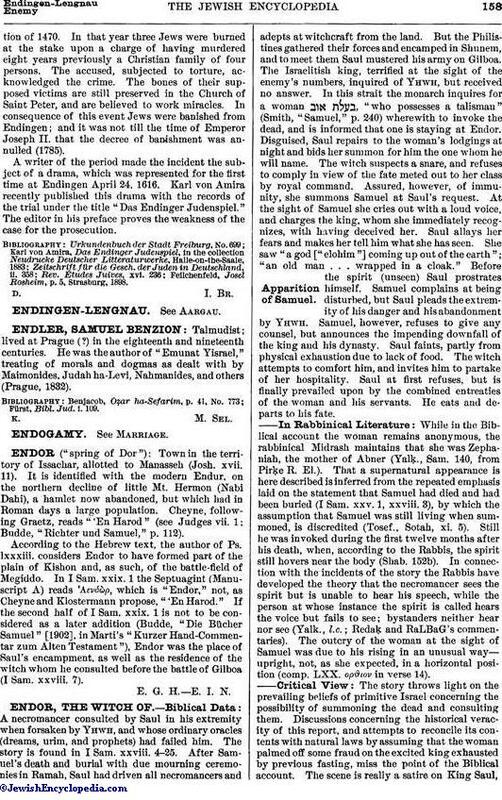 1 the Septuagint (Manuscript A) reads Αενδὼρ, which is "Endor," not, as Cheyne and Klostermann propose, "'En Ḥarod." If the second half of I Sam. xxix. 1 is not to be considered as a later addition (Budde, "Die Bücher Samuel" , in Marti's "Kurzer Hand-Commentar zum Alten Testament"), Endor was the place of Saul's encampment, as well as the residence of the witch whom he consulted before the battle of Gilboa (I Sam. xxviii. 7). E. G. H. E. I. N.